Oster is a well-known brand name when it comes to blenders. Lots of people use these tools for a variety of purposes, from smoothies to soups and salsas. Consequently, the brand offers a variety of models that have slightly different benefits and designs. 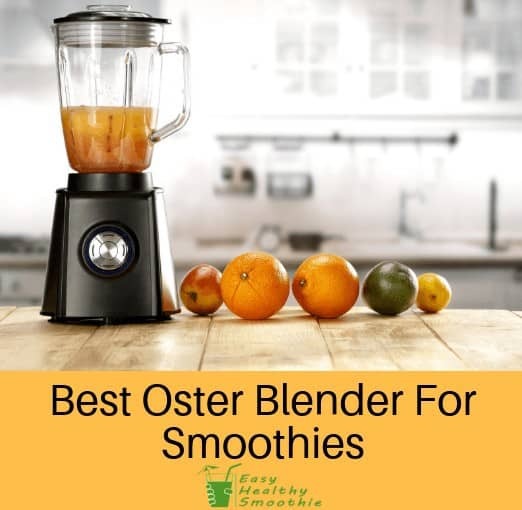 Thanks to the large amount of choice, you should be able to find the best Oster blender for smoothies that will meet your needs and suit your budget. For those who want a lot of power and capacity, the Oster Crush is a great choice. Spec 2: Class pitcher holds 6 cups. It's hard to go wrong with 1000 watts of power. That's more than enough for most people to get what they need blended or mixed. The 6-cup pitcher will also be able to handle larger amounts for those who want to save or share what they're making. Those who try out this device typically find that it's very reliable, allowing them to get exactly what they need without paying an insane cost. It also offers a long warranty. This device can be quite loud during use. In addition, breakages can occur and not all of the parts that may break are covered by the included warranty. If you don't mind something with a little less power, this reliable blender is a fantastic option. If you don't need a ton of power in your blender, this is a great choice. The 5-cup pitcher and 600 watts of power may seem humble, but they can handle most of your blending needs. You'll also be able to rely on the long warranty to protect your investment just in case any problems should occur during normal use. Most people find that this is a durable, versatile product that allows them to get a lot done in a single device. It also comes at a great price, and tends to be a reliable daily choice. Some users can find that the motor may emanate some burned smells if it becomes overworked. Furthermore, it offers less power than many other options out there. If you're on the hunt for a quality middle-of-the-road option, this is the way to go! What sets this blender apart from others is its pitcher's beehive design, which some users prefer to other designs. It's able to hold up to 6 cups, and the 1000-watt motor can get through just about anything you may need. The 10-year warranty is also a great addition! For those who just want something reliable, it's worth looking at this blender. This is a perfect blender for daily use, allowing you to make a daily smoothie and wash it clean easily. It's also known to be very durable, which is fantastic! Keep in mind that this can be a rather loud unit. Some can also find that they need to replace the blades with better ones, as they can leave chunks. If you're looking for a budget friendly option with a lot of features, take a look at this blender! Spec 1: Uses a 600-watt motor. Spec 2: Glass pitcher holds 6 cups. This is another great option for those who don't need a ton of power and want to save some money. It can hold quite a bit of whatever you're making and the 600-watt motor gets through most things pretty easily. It's also designed to handle different temperatures with ease. If you need something just for occasional use, this is a great choice. Users who are fans of smoothies find this to be a great blender for making them. It's effective on most ingredients and easy to clean once you're finished. Just like any other product out there, sometimes breakages can occur. In addition, some users have had troubles with customer service while trying to get problems solved. For the perfect combination of power and affordable pricing, this is the Oster blender to check out! Spec 2: Pitcher capacity of 6 cups. If you like a touch of color in your kitchen, this option allows you to pick from red, blue or silver. You'll also be able to make up to 6 cups of smoothies or other food, taking advantage of the 1000 watts of power. The included blade is design to be perfect for crushing ice. It's a simple device with plenty to offer for those who just want something that gets the job done. Overall, customers get a lot of value from this product. It offers more power than some other options at a lower price, so you'll get exactly what you need. This option is very effective for daily use. Some users can find that units are wobbly due to an uneven design. In other cases, there can be unpleasant plastic smells that come from the device. While it performs at a similar level to other options in this list, the Oster BPCT02-BA0-000 is available at a lower price, making it great value for money. It's a reasonably powerful option, with a larger pitcher and a simple but effective design overall, which is what most users need. However, the other options on this list are worth a look as well. Generally speaking, you can expect similar performance from the models since they are made by the same brand. They offer varying amounts of power and capacity and have different price tags, so you'll be able to select what fits your budget and needs best.